Explosion Hits Nuclear Power Station In Northwest France : The Two-Way The electric utility that operates the plant says there was "no victim and no consequences for safety and the environment." The Flamanville nuclear power facility sits on the shore of the English Channel. Officials say a fire at the plan has been contained. 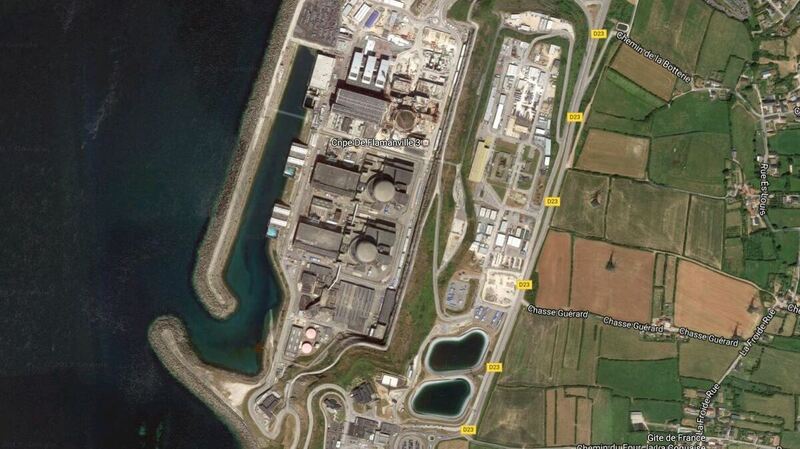 An explosion at the compound of the Flamanville nuclear power plant was "a significant technical event but it is not a nuclear accident," an official tells local media. A fire that was also reported in the engine room where the explosion hit is now reportedly under control. The plant has two reactors; the fire and explosion took place in the engine room of reactor No. 1, which was automatically shut down, France Info reports. The outlet adds that while there were no serious injuries, five people suffered slight intoxication, evidently from the fumes. The explosion hit around 10 a.m. local time at the nuclear power generating facility along the English Channel, according to news site Ouest France. Citing Olivier Marmion, Chief of Staff of the prefect, Ouest France says the trouble occurred outside the plant's nuclear zone. EDF, the electric utility that operates the plant said Thursday that there was "no victim and no consequences for safety and the environment."